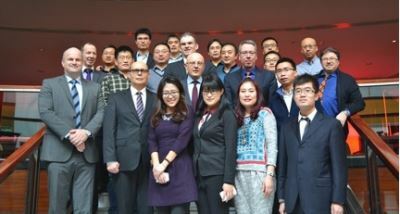 HEINKEL DRYING AND SEPARATION GROUP further increases its commitment in Asia and hosted a two-day meeting in March 2014 nearby Shanghai. The sales meetings took place at the group´s representative agency in Wuxi nearby Shanghai. In the course of extending the product portfolio for the Asian market, representatives of the companies Terlet and Jongia also participated. As well as the HEINKEL DRYING AND SEPARATION GROUP, they are part of the Stibbe Management Group and do business in the field of food and pharma. More than 30 representatives from Europe and Asia in the area of management, product management and sales met to exchange ideas and information. Besides strategic topics, product highlights were on the agenda as well as effective trainings for the expert´s numerous products for solid-liquid separation. “Such international meetings are very important to be up to date in regards of strategy and product relevance”, says Thomas G. Kleiner, managing director of HEINKEL. “The meeting creates the base for even more successful cooperation in the future”, says Thomas G. Kleiner, satisfied with the two-day meeting. By opening a representative agency in China in 2012, the group of companies had set the conditions for its increasing commitment in Asia. Additionally to sales, customers also benefit from professional local support for operating their process equipment and systems.